MDB20 magnetic rotary encoder module has a precision sensor having an integrated Hall element for scanning a permanent Dipole magnet. The Sensor itself generates a constant amplitude Sine and Cosine voltages that is used for angle calculations. These Sine and Cosine signals are further interpolated to get the Incremental or Absolute signals with resolutions up to 14 bits per rotation. 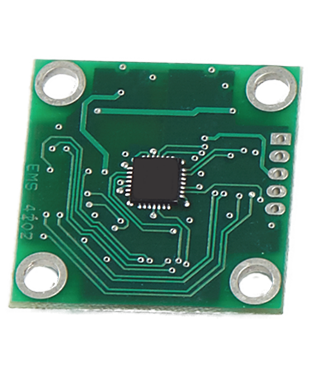 MDB20 module is a 20mm PCB assembly which can be used in any small designs with ease of installation. 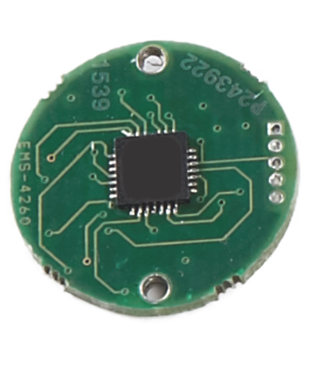 MDB28 magnetic rotary encoder module has a precision sensor having an integrated Hall element for scanning a permanent Dipole magnet. The Sensor itself generates a constant amplitude Sine and Cosine voltages that is used for angle calculations. These Sine and Cosine signals are further interpolated to get the Incremental or Absolute signals with resolutions up to 14 bits per rotation. 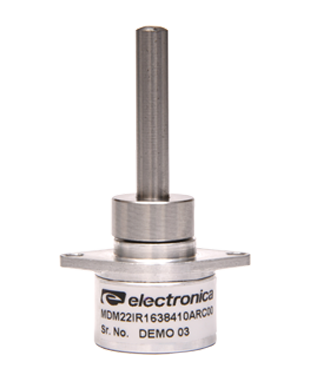 MDE16 is a very compact magnetic rotary enclosed encoder with a shaft. It has a precision sensor having an integrated Hall element for scanning a permanent Dipole magnet. The encoder can give Absolute as well as incremental outputs up to 14 bits per rotation. MDE16 enclosure is designed like a miniature enclosed shaft encoder allowing for very easy and compact installation in applications. Its IP68 robust design makes it ideal for use in harsh environments. 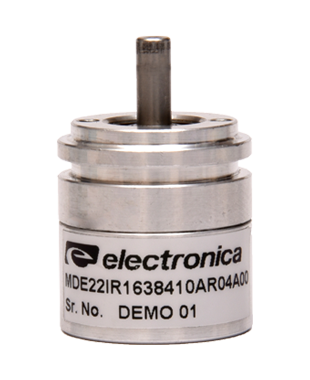 MDE22 is a magnetic rotary enclosed encoder with a shaft. It has a precision sensor having an integrated Hall element for scanning a permanent Dipole magnet. The encoder can give Absolute as well as incremental outputs up to 14 bits per rotation. MDE22 enclosure is designed like an enclosed shaft encoders allowing for very easy installation in applications. Its IP68 robust design makes it ideal for use in harsh environments.